Welcome to the eight issue of the Columbia College Class of 1963 eNewsletter. You may have noticed that I skipped our September issue, apologies, but my schedule was happily very busy, and your news was a little sparse. To be honest, we've had such a nice Indian Summer in the North East, and I have been spending far too much time at the Jersey Shore. The big news this month is Homecoming Weekend, which I hope will be especially well attended by the Class of 1963. We've moved the class lunch at the Columbia Club to Friday, October 14 at 12:30, so that any out-of-towners coming in early for the weekend have an opportunity to attend. Look for the Class of 1963 table in the Big Tent at Baker Field on Saturday morning (11 AM). We hope to have a good crowd. If you would like to sit together at the Game (Penn), and you don't have tickets yet, let me know right away. I'll try to get a block of seats. Since our last eNewsletter we have followed the news of the terrible destruction in New Orleans and entire Gulf Coast. First Katrina and then Rita. I hope that all of you in the path of these storms are safe. I was in the region several weeks before, and see that just about all the towns I visited and the roads I traveled while on my business trip to the Stennis Space Center have been totally wiped out. Very disturbing. Bob Heller was unable to attend our last luncheon as the group he heads, the Union for Reform Judaism, was in the middle of organizing part of the relief effort. He was kind enough to fill me in on their efforts, which you will find below in the class notes. At the request of many of you, I've added a link to an archives page, which in turn, will link you to the past issues of the Class of 1963 eNewsletters. There may be some broken links in the earlier issues, which I will fix when I find them. If you have any difficulties reaching any of these pages, let me know. I hope that you are finding this eNewsletter interesting, I have had a great time hearing from all of you. Judging from the number of people who have been asking me to put them in touch with old friends mentioned here, I think that many of you share my desire to reconnect with old friends. I have heard from close to a hundred of the you since I started as your class correspondent a year ago. The class luncheon in New York has been attended by over 25 of you, and many of you have become regulars. I hope many more of you will attend. Keep those notes coming, and share with us your memories and your recent news. I know that there must be many more who have lost contact with Columbia. Again, if you know how to contact any of these classmates, please let me know. And send me the names of your lost friends, and we will try to find them. Special Date for Lunch (this month only) Friday, October 14, 12:30 p.m. to 2:00 p.m. Please join your classmates for an informal lunch at the Columbia Club every second Thursday of the month (this month this falls on a Friday). It is our hope that these gatherings will renew old friendships and foster improved relationship with our class and the College. Because of the Homecoming Weekend, the next lunch will be on Friday, October 14, 2005. 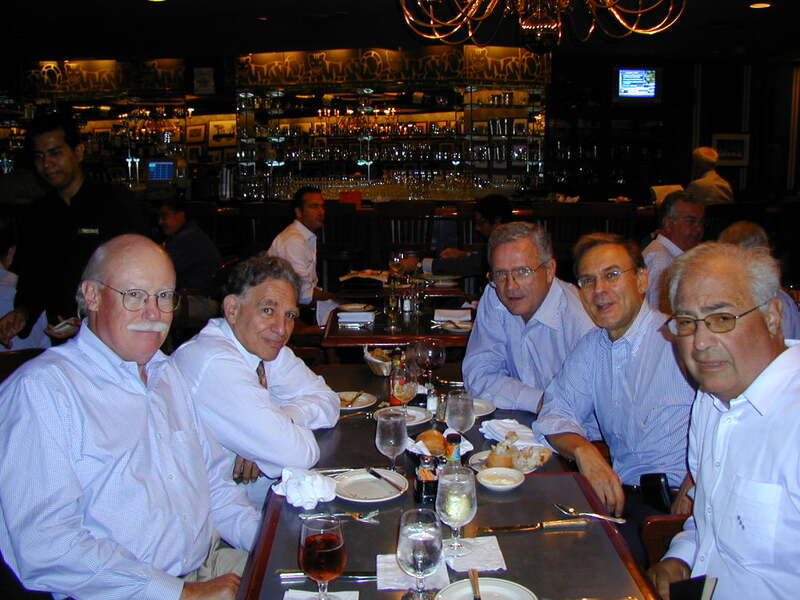 The eighth Second Saturday Class of 1963 lunch was held on September 8. It was a wonderful, warm, post-Labor Day Thursday as you can judge from the shirtsleeves of the five regulars in attendance. We were seated next to six members of the Class of 1964 (I recognized Norman Olch and Nick Rudd), who will regularly be meeting on the same schedule (second Thursday), and five from the Class of 1960, who had postponed their monthly lunch from the previous Tuesday (because of Labor Day). Several of them including my old fraternity brother and crew coach, Art Delmhorst, came over to visit. Here is our fine group, and also some of our friends from '60. I hope you can all join us (please encourage your friends to come with you) at the next lunch on Friday, October 14. Let me know if you will attend so that we can reserve a big enough table; RSVP to Paul Neshamkin (pauln@helpauthors.com). Very little news this issue, I hope that now that you are all back from vacation, you will write. Here is a selection of the unedited (and unexpurgated) notes and news that you have sent in the last month. wrote in response to my email, "You asked about the disaster relief work my organization, the Union for Reform Judaism, is doing in the aftermath of Katrina and Rita. The Union is the congregational arm of the Reform Jewish Movement in North America with some 900 congregations and 1.5 million people. The report below is a recent summary of our relief work. Apart from providing an opportunity for those wanting to write checks, which led to an overwhelming outpouring, we were invited by the Mayor of Utica, Mississippi, where we operate a summer camp, to run a local distribution center. Utica, itself a low income area, has seen its population nearly double with evacuees from Mississippi and New Orleans in need of food, shelter and services. Virtually overnight, our staff with strong lay support, put together the Jacobs Ladder project. It involves our operating a warehouse in Utica, Mississippi and distributing goods -- collected primarily by our congregations across North America and shipped in to Utica -- through a network of local churches in what is a remarkable interreligious effort. The project has captured the imagination of our congregations and engaged many in hands on work. The staff and volunteers who went down there to create and run the distribution business until the relevant service providers step in, which we hope will [be] by the end of October, have been deeply moved by the experience. As the report and internal links describe, two of our camps in the region also served as evacuation centers. It has been an inspiring response." Bob, that's terrific. I hope that many of you will also lend a hand, either by contributing to Bob's organization, or other agencies such as the Red Cross. It is going to take a huge effort to return New Orleans and the Gulf Coast to any semblance of what was once a beautiful part of our country. The suffering and loss is immense. writes, "I’m currently retired & working on 2 books (paternal custody & intergenerational transmission of left political culture)." He has been married to Judy Lieberman (Professor at Harvard Medical School doing immunological & AIDS research) for 34 years. And has two sons, both Ph.D. students in molecular biology (Paul at Harvard, Eric at Stanford). "After Yale Law School my career encompassed teaching in liberal arts & law schools, practicing law, writing scholarly books and articles, and considerable radical activities in sundry arenas. Overall, a very good life." writes, "After Columbia College I was married and am still married 42 years later. Then I spent two years in the doctoral program (Inorganic Chemistry) at MIT. But chemical research was not my forte. So I joined Shell Chemical Company's plastics and adhesives business as an "industrial" market research analyst. I continued in this kind of work with Citgo Petroleum's chemical and plastic division, Allied Welding, and General Electric's computer business. I also pursued an MBA at City University night school. The General Electric assignment brought me to the Washington DC area, where I have been ever since. I worked for 2 small consulting firms, the last one as a senior partner. Then I joined the Federal Government. First I worked for the Commerce Department's Economic Development Administration, fostering industrial/commercial growth in areas of the nation that were suffering economic failure (i.e., Appalachia, New England manufacturing, etc.). Then I joined the U.S. Atomic Energy Commission's Regulatory Operations staff. This later became the U.S. Nuclear Regulatory Commission. I spend 29 years at this agency, retiring in June 2002. I was involved in policy development, economic and budgeting analysis, productivity analysis, computerization and computer system development and use, license fees and a myriad of other activities. I also served on various advisory committees working on equal opportunity, labor-management relations, and "employee differences of professional opinion" (comparable to whistleblowing). I served in the offices of Nuclear Reactor Regulation, Inspection and Enforcement, and in the Commissioner's Policy Evaluation staff. During this time I raised 4 children (who have between them 15 grandchildren) who now live in the Washington area, New York area, and in Jerusalem, Israel. [My three daughters each have master's degrees and one received both her degrees in electrical engineering at Columbia University.] I served on the boards of several religious schools, and became very active in local groups involved in disabled persons support (my last child, a 26 year old son, has Downs Syndrome), and a few Montgomery County, Maryland commissions. Since retirement I have not enough time to do all the things I want to do. I traveled, throughout my work period and into retirement, in Europe, the U.S. and the Middle East until last year, but such travel has become difficult. I avidly collect books in 10 different disciplines/areas. I also collect objects in glass, silver and wood. I love going to museums, parks, concerts, and plays. I love reading, watching movies via my vcr/dvd, and searching for interesting things on the internet. I am very involved with communicating and being with my children and grandchildren. Life is pretty good, particularly in retirement, and we are quite financially secure, even though it is primarily from government-based pensions." Writes, "I have very much enjoyed reading about my former Columbia classmates the last few months. As for myself I have been a practicing clinical psychologist and psychotherapist for 37 years in Philadelphia and Plymouth Meeting, Pa. since receiving my Ph.D. from the Univ of Wisconsin in 1968. I met my wife Teresa, in Wisconsin and have been married almost 40 years with one son, Matt, who is a TV anchor and soon to be university teacher in Bangor, Maine. I had been on the Jefferson and Hahnemahn Medical School faculties in Philadelphia for over 25 years and now am an adjunct faculty member of the Institute for Transpersonal Psychology in Palo Alto, Cal. (though I live in Plymouth Meeting, Pa. a suburb of Philadelphia) I have published about 30 articles and chapters in various journals and books and am the author of a book "Creating Well-Being: the Healing Path to Love, Peace, Self-Esteem and Happiness" and the" Integrative Healing Manual" plus the "Friedman Assessment Scales: (see www.integrativehelp.com). I recently published 2 chapters on "Integrative Energy and Spiritual Therapy and Healing. "and currently am co-writing a chapter on "Spirituality, Religiosity and Quality of Life" for the upcoming International Encyclopedia of Quality of Life and working on some research articles on "Forgiveness, Gratitude and Well-Being, Quality of Life and Life Satisfaction" All 3 of these topics are strong, current interests of mine. The main person I have kept in occasional contact with from Columbia has been my roommate, Jack McMullen, He has been a very successful and now semi-retired, I believe, businessman, who recently ran for Senator of Vermont. Two of the main influences on me at Columbia were Dr Fred Keller, a very well-known psychologist at the time, who in addition to his large introductory psych class ran a small senior seminar (2 students I recall) in his tiny but intimate office, on teaching machines. Keller was a very warm, open, enthusiastic and supportive white haired professor who spent most of the semester regaling us with stories from his recent sabbatical year in Buenos Aires, Argentina, where he helped them set up a behaviorally oriented psych lab. The other major influence was Professor Caplovitz in the sociology department who ran a small class (6 students or so) on personality and the socialization process. It was very intellectually stimulating and superbly taught. Unfortunately he was a non-tenured assistant professor and was not rehired the next year, in part I am told because of the small enrollment of our class. I was quite saddened and slightly shocked at the time I remember. Looking back I greatly appreciate both their contributions to my life." writes in response to my request for news, "I'll write something one day. How do you sum up forty plus years since Columbia? People do it and I suppose I can too." Great! we eagerly await to learn more. responded to my request with the following: "You can get a quick idea of where I'm at from my web page. Hope we meet up one of these days." The regular Class luncheon at the Columbia Club has been moved to Friday, October 14, in case any of you are planning to return to New York for the Homecoming Game. On Saturday, October 15, I invite any classmates to join me at the Homecoming tent in the morning at Baker Field, and then watch Columbia beat Penn at the Homecoming game that afternoon. Let me know if you plan on attending and need tickets as soon as possible, and I will try to get a block of tickets reserved so we can sit together. But other than that, I will not plan on any other "reunion" events unless there is a sudden show of enthusiasm. Please let me know. Maybe next year, we'll be able to organize a larger, more meaningful mini-reunion. As I asked before, anyone want to volunteer to help me out?